Imagine stepping out onto the football field in running shoes. How long do you think you would last? The reason why football players – like most other field sport players – wear cleats is because it provides intense traction to keep you from slipping and falling. Cleats act as grips, grasping at the ground to keep you on your toes. The right shoe for you will depend on the position you play, but it helps to understand the anatomy of the football cleat. Midsole: Also known as the “footbed,” the cleat’s midsole provides foot support and cushions on both the heel and balls of the feet. Modern cleats are often fitted with foam and other technologies that minimize impact. Common technologies include EVA foa, (which is a type of closed cell foam, Sneaker Freaker says), Phylon wedges and Poron inserts. Outsole: The outsole is where the actual cleats are attached. The cleats are what provide traction. There are different cleat configurations and types of outsoles, which have different effects. Some improve speed, while others enhance agility and others help you stop on a dime. Upper: The cleat’s upper is made of either leather or synthetic material. This is the outer layer of the shoe, and the highest quality shoes have uppers built for durability, breathability and comfort. Detachable Studs: Detachable cleats are longer and usually more powerful, according to Complex. These provide amazing traction and grip on a variety of different fields. Because these are detachable, you can remove them and change them whenever you please. These are the types of cleats used by the pros and advanced players in high school and college. Hard Molded Cleats: These cleats are molded plastic spikes that are permanently attached to the outsole of the shoe. These types of cleats provide great traction on artificial turf and firm ground. Mid Cleats: Mid cleats provide a moderate amount of ankle stability without compromising on speed or mobility. Mid cleats are the preferred choice of defensive backs, quarterbacks, wide receivers and running backs. High Top Cleats: The high top cleat provides maximum ankle support and stability to prevent rolling and twisting. But this extra support and protection comes at a price: restricted movement and reduced speed. This cut is better suited for players who make lateral movements, like lineman and defenders. Low Cleats: A low-cut cleat provides maximum mobility because the ankles can move freely. These types of cleats allow players to maximize speed and make more aggressive cuts on the field. 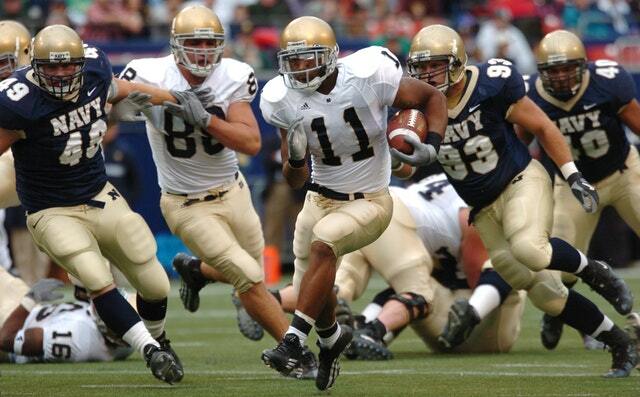 If you plan on running the ball up the field, you need low cleats to outpace the competition. With all of these things in mind, you can start looking for cleats based on the position you play. Of course, if you play in a league, always consult with your rulebook to ensure that the cleats you buy are allowed as per the rules. Wide receivers need more than just speed – they need agility, too, says Bleacher Report. As a wide receiver, you need a cleat that is light, and a low-cut cleat is usually the best option because they allow for more freedom of movement. Higher cut shoes can restrict ankle movement, which makes it harder to pick up speed. Of course, quality and durability are important factors to consider, but these two things need to be considered regardless of which position you play. If you have wide feet, there are cleats that come in wider sizes. And there are varying levels of width, so you can find a size that fits your foot comfortably. Along with a wide width, you can also look for shoes that have different lace patterns that are conducive to your foot’s natural shape. Look for shoes from brands that are designed specifically for players with wide feet, so you get the support and mobility that you need to play your position successfully. Speed is the name of the game if you’re a running back. You can’t be tackled if enemy players can’t catch you. Running backs need a cleat that will propel them into the open field so they can outrun their opponents. Running backs tend to gravitate towards low- or mid-cut shoes because they provide ankle support without compromising on mobility. These types of shoes give you a happy balance of ankle support and free movement. In this Eastbay video, running backs talk about their preferred types of cleats. The best cleats for a lineman will depend on the type of lineman position you’re playing: offensive or defensive. The offensive lineman position is one the only ones in football where speed isn’t the most important thing. To succeed in this unique position, players need the right shoe that promotes agility. Defensive lineman, on the other hand, have to be versatile on the field, so they need a versatile cleat. The best lineman need strength to attack the run gaps, but need to be fast enough to weave in and out of tackle attempts to get to the quarterback. Along with traction and good ankle support, defensive lineman also need a shoe that’s lightweight enough to give them that extra boost to rush to the backfield. If you’re playing on soft ground, you need a cleat that provides maximum traction. Without an intense level of traction, you will slip and slide across the field without the control you need to make winning plays. Detachable cleats are best for soft ground, but you also need ankle support. Our extensive guide on buying cleats for soft ground can help you find the right pair for your needs. If you’re buying cleats for a child, all of the above rules apply – just on a smaller scale. You might consider taking your child to a local specialty shoe store to be properly fitted. Make sure that the child’s foot is measured while standing and bearing their full weight, i9Sports recommends. Choose shoes that fit the larger foot, or wearing the cleats can quickly become uncomfortable. Cleats have to be comfortable, especially with children, says USA Football. Otherwise, you will struggle to get the child to wear the cleats and play the sport. Comfort, support and the position played – which will dictate the type of cleat the child should wear – are important, but you must also look at the equipment requirements. The child’s team or organization may specify certain types of cleats to wear. If playing indoors, cleats may not even be allowed, so make sure that you check the requirements before you even start shopping. If you follow the advice above, you’ll be able to find cleats that help you excel at your position.